The Noödynamics Institute® is a non-profit foundation organized exclusively for charitable, academic, and educational purposes. The specific purpose of the Institute is to function as a cultural institution promoting scientific literacy, spiritual attitudes, and artistic sensibilities for the public welfare and beautification of society through a multilayer educational forum of interdisciplinary discourse. 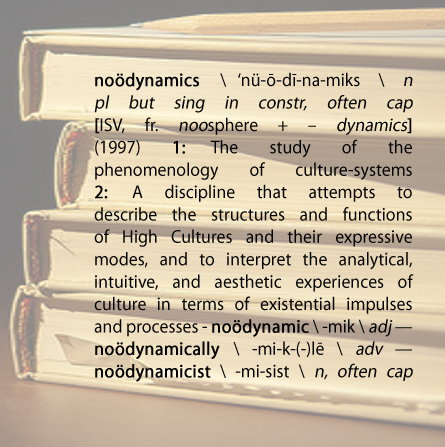 The Noödynamics Institute is a tax-exempt organization under section 501(c)(3) of the Internal Revenue Code, promoting a worldview predicated upon the idea that all forms of cultural expression have an underlying systemic coherence, and that this architectonic makes possible an existential reunification of all expressive modes in an integrated society. This work is of a paradigm-shifting nature. The science of Noödynamics explores the expressions of civilizations through their six fundamental modes: science, spirituality, art, philosophy, religion, and technology. Its goal is to demonstrate empirically that every culture-system is what biologists call a “complex adaptive system,” and that only this reality, understood, makes the diverse phenomena of world-history fully comprehensible. A full exegesis of this theory and practice is available in The Phenomenology of Culture-Systems, which is being made available in our Books section.